1745-1811. He was born in Lamorran, near Truro, Cornwall and baptised on 30 July 1745, being the son of John Reynolds, and of his wife Elizabeth Carthew. In 1759 Reynolds entered the navy aboard the Hero 74, commanded by his patron, Captain Hon. George Edgcumbe, which ship fought at the Battle of Quiberon Bay on 20 November, and was later commanded by Captains William Fortescue and Hon. Samuel Barrington prior to being paid off in December 1762. He served afterwards for a short time aboard the frigate Brilliant 36, Captain James Logie. Following the end of the Seven Years War Reynolds saw duty on the Newfoundland station from 1763-6 aboard the Pearl 32, Captain Charles Saxton. He subsequently served from 1768 for a year on the crack frigate Venus 36, Captain Hon. Samuel Barrington, and after leaving her in June 1769 he passed his lieutenant’s examination on 1 May 1770 but was not able to earn a commission. Reynolds was eventually commissioned lieutenant on 26 February 1777, and during the American Revolutionary War he saw service aboard the Royal George 100, Captain John Colpoys, flying the flag of Vice-Admiral Sir Robert Harland in the Channel from November 1778 until that officer resigned in November 1779. He was afterwards on the Barfleur 98, which Captain Benjamin Hill commissioned in the summer of 1780 as flag captain to Vice-Admiral Hon. Samuel Barrington in the Channel fleet, although Barrington and Hill resigned their positions towards the winter. With the change of government in 1782 Barrington and Hill joined the Britannia 100 to serve in the Channel Fleet, and Reynolds again found a berth in their wardroom. On 18 April 1783 Reynolds was promoted commander of the armed store ship Dolphin 44 serving in the West Indies, and in March 1786 he recommissioned the sloop Echo 16, going out to Newfoundland in the following three summers prior to being paid off in December 1788. On 24 September 1790, during the Spanish Armament, he was posted captain, briefly joining the Barfleur 98 as temporary flag-captain to Vice-Admiral John Elliott, following which he retired to his estate at Penair near Truro. Reynolds remained on the beach for two years after the start of the French Revolutionary War before he was appointed to the Druid 32 in 1795, which frigate returned to Portsmouth from a cruise in June, and then underwent a refit in early July. In August he was appointed to the newly-launched Amazon 36 at Deptford, which returned to Portsmouth from a cruise in January 1796. He was present at the capture of the Unité 38 on 12 April and the Virginie 40 eight days later whilst attached to a squadron of five frigates under the command of Captain Sir Edward Pellew. Further captures with his consorts were the Trois Coleurs 14 and Betsy 16 off Brest on 13 June. During December he was sent by Pellew to inform Admiral Lord Bridport that the French invasion fleet had set sail for Ireland, and he also carried this news to Falmouth for delivery to the Admiralty. On 13 January 1797 the Amazon assisted Pellew’s Indefatigable 44 in the destruction of the French Droits de l’Homme 74 off Brittany, but Reynolds could not prevent his own command from going ashore, losing three men killed and fifteen wounded in the action, and then six who drowned when the frigate was wrecked. He was well treated in imprisonment, and after being exchanged by the French in September he returned to Falmouth in a cartel with his third lieutenant, sailing master and purser, and was honourably acquitted at the subsequent court-martial into the Amazon’s loss on 25 September aboard the Cambridge 84 in the Hamoaze at Plymouth. Almost immediately he was appointed to the ex-French Pomone 44 in the room of Commodore Sir John Borlase Warren, which frigate had been captured in 1794. In this vessel, cruising between the Scilly Isles and Ushant, he defeated the Nantes-based privateer Chéri 26 on 5 January 1798, losing one man killed and four wounded, although the enemy vessel was so damaged that she was sunk after one hundred and eighty men had been taken out of her. He then caught and sunk the privateer Emprunt Fossé 2 on 11 January before coming into Plymouth and landing the many prisoners he had taken out of these two vessels. 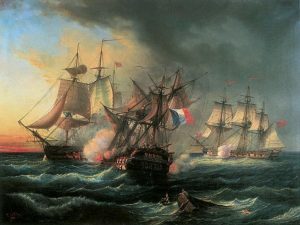 In the middle of September the Pomone escorted the Lisbon and East India convoys out of Falmouth, during which voyage Reynolds prevented an attack by the Ireland-bound Brest expedition consisting on one sail of the line and eight frigates through the ruse of forming a line with the Indiamen and thereby giving off the appearance of a more powerful squadron. The French force later met defeat at the hands of Commodore Sir John Warren off Ireland on 12 October. Amongst many captures the Pomone took during Reynolds’ command was the new Bordeaux privateer Argus 18 off Cape Finisterre on 3 April 1799 after a one hundred and eight mile chase, having recaptured one of her prizes, a West Indiamen, just a few days before. His frigate briefly entered Falmouth before sailing out on a cruise again on 10 April, and she subsequently served in the expedition to the Netherlands from August to October before sailing to Portsmouth from the Downs in November. He finished his tenure in the Pomone by escorting the Lisbon convoy out in January 1800 and returning with another convoy from the Tagus to Portsmouth in April. Although it was reported that Reynolds would join the Cumberland 74 in the Channel during January 1801, that ship instead received orders for Jamaica and he was appointed to recommission the Orion 74 at Plymouth for the Channel fleet at the end of February. During Admiral Ganteaume’s cruise from January – July he sailed to the West Indies with Rear-Admiral Sir Robert Calder’s squadron in search of the French, and he later served off Rochefort, returning to Plymouth from that blockade in early September. Upon putting back to sea the Orion lost her main and mizzen masts in a gale and was forced to run for Bantry Bay in Ireland, and when she did return home she had to be towed into Cawsand Bay, Devon, by the boats of the fleet. Reynolds left the command early in the new year when she received orders to sail for Jamaica. After hostilities were renewed in 1803 Reynolds commanded part of the Cornish Sea Fencibles before joining the Dreadnought 98 in the Channel in May 1804, serving at the blockade of Brest and returning to Plymouth briefly in July. In August he removed to the Princess Royal 98, going out from Plymouth to join the blockade of Brest in the following month. This vessel was employed on the Irish station in early 1805 under the orders of Rear-Admiral William O’Brien Drury, and was at Falmouth in November 1806 before rejoining the Channel fleet, with which she remained until she sailed to Sheerness in February 1807 to be paid off and laid up at Chatham. Reynolds was thereafter employed as the paying commissioner at Plymouth until he was promoted rear-admiral on 28 April 1808. In April 1810 he was appointed the second-in-command to Vice-Admiral Sir James Saumarez in the Baltic and he raised his flag on the St. George 98, Captain Daniel Oliver Guion, going out in the following month and returning to the Downs in the last week of October, whereupon he returned to Cornwall for the winter. In March 1811 he was ordered to proceed to St. Helens from Portsmouth and early in the following month sailed once more for the Baltic. Come November 1811 Reynolds was still in the Baltic preparing to return to England with a large convoy, but early wintry conditions prevented their departure, and when they did get to sea the St. George was struck by a merchantman and had to retire to Wingo Sound in Sweden for a temporary refit. On 17 December she set sail again in the company of the Defence 74, Captain David Atkins, and the Cressy 74, Captain Charles Dudley Pater, but in desperate weather near Ringkjöbing off Jutland the Defiance and St. George drove aground on 24 December. Only twelve out of the flagship’s crew of eight hundred and fifty men were saved, and after Rear-Admiral Reynolds succumbed to the elements on Christmas Day his body was never found. A widower by the time of his death, Reynolds had two daughters in addition to two sons in the navy by his wife Elizabeth Jane Vivian, whom he had married at Cardinham, Cornwall on 7 December 1779. The elder son, his namesake, was badly wounded at Fort Royal, Martinique on 4 February 1804 when first lieutenant of the Centaur 80 during the brilliant cutting out of the brig Curieux, and having been promoted commander he died in September of that year. His second son was Admiral Sir Barrington Reynolds. He was considered to be brave and a meritorious officer.